Queensland Health clients who are not proficient in English will be provided with an interpreter at Queensland Health's expense. The Queensland Health Interpeter Service provides interpreters 24 hours a day, seven days a week in all Queensland public health facilities. 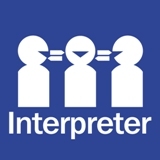 Staff can book interpreters on behalf of patients via the Interpreter Service Information System. Clients who require an interpreter should inform staff before they arrive at a Queensland Health facility. The Queensland Government Language Services Policy states that NAATI accredited or recognised professional interpreters should be used and that non-professional interpreters should not be used unless the situation is urgent and a professional interpreter is unavailable. Interpreters may be engaged in person, over the telephone or via video conferencing facilities depending on the availability of a suitably qualified interpreter.